Vintage - Royal Standard Fine Bone China Tea Set - Trend Pattern - Made in England from 1960 through 1979 - Totaling (16) Pieces - Creamer & Sugar not in Main Picture. This great Mid-Century, yet Modern, Royal Standard "Trend" Pattern Colors consists of Aqua, Green and Gray Leaf Pattern that is on a Bright White Background on all Pieces, and all are Trimmed with 22kt Gold Rims, 22kt Gold Feet, and 22kt Gold Handles on Cups, and Platter. 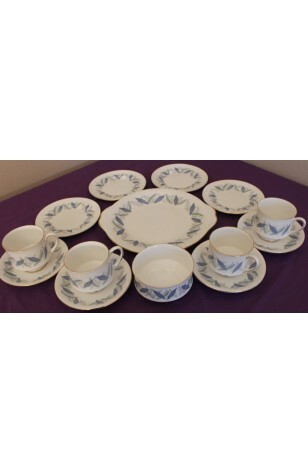 A total of (16) Pieces allowing a Service for Four, including Creamer w/tiny chip on rim, Sugar Bowl, (which are not in the main Picture) and a Waste Bowl, and Cookie Platter. 4 - Bread/Dessert/Tea Plates - 6 1/4"